Take a look at the 2019 NCAA tournament's Sweet 16 schedule and bracket. Only 16 teams remain in the big dance as the 2019 NCAA tournament picks back up again on Thursday with the start of the Sweet 16. This week is often a good time to re-pick and reevaluate teams after seeing what they've been able to do through two March Madness clashes before another eight hopeful title contenders are cut. The stakes get higher and the losses tougher this weekend. Thursday's first tip off is set for 7:09 p.m. 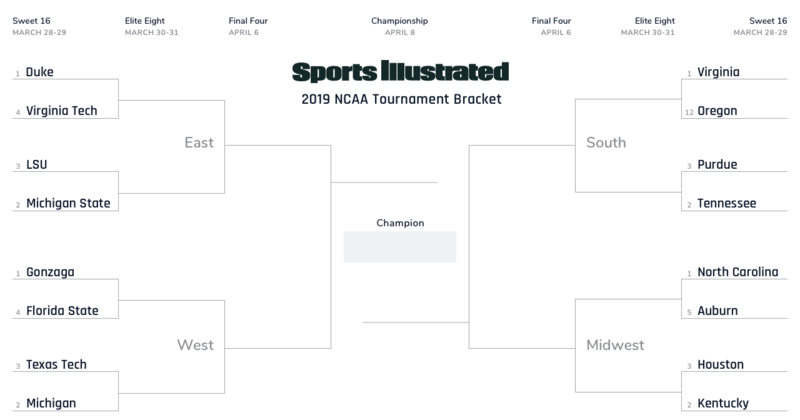 ET and we've got the Sweet 16 bracket followed by a complete schedule and predictions for each game to get you prepared. Prediction: The Seminoles have the athletes, the size and the depth up front to take away Gonzaga’s offensive advantage in this matchup, and Mfiondu Kabengele has quietly been a breakout star. Florida State could end Gonzaga's run for the second straight season. Prediction: After barely surviving Iowa’s last stand, the Vols will refocus, clamp down on Carsen Edwards, and outlast a pretty evenly matched Purdue team. Admiral Schofield and Grant Williams aren't done dancing yet. Prediction: The Wolverines are back in top form thanks to Zavier Simpson and Jon Teske. If you're looking for a high-scoring affair, this game might not be for you – but Michigan win out with three-point shooting in a matchup of the nation’s two best defenses. Prediction: The Ducks 10-game winning streak will end in the Sweet 16. Virginia’s style of play is designed to slow down teams of their ilk, and the ‘Hoos have more left to prove than anyone in the field after last year. Prediction: The Spartans boast a little more offensive firepower (cough, Cassius Winston, cough) than the Tigers and their defense is locked in which should carry them to a win this weekend. Naz Reid and Tremont Waters will have a tough time getting points in the paint against the Spartans in this one. Prediction: The Tar Heels have the talent, leadership and Coby White to make it tough on a hot Auburn team. The Tigers have won 10 straight, but if there’s anyone you don't want to play right now, it’s Carolina. Prediction: The Hokies already toppled Duke once this season, but both teams were missing their best players. At full strength, this game will look considerably different. Duke is still the favorite to win, especially now that they've got something to prove after a scare against UCF. Prediction: As much as I'd like to get a little less chalky here, with PJ Washington potentially back on the floor for Kentucky the Wildcats will likely win out in this one. It'll be hard for Houston to stop them on offense or post enough points against Kentucky's frontcourt to end up in the Elite Eight.